Description: Diskmag "HUGI", issue 36.
at the Lincoln Center in New York. We celebrate this anniversary! and reading Hugi for almost 15 (fiveteen) years now! More specific credits inside Hugi#36. your pleasure! Most of them composed tracks on the Amiga also! Newbies, Optimus, Mindcandy 3, and much, much more inside! 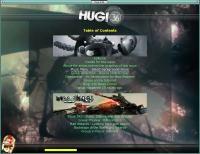 YouTube link inside Hugi #36. Bridgeclaw when you are inside an article. Hugi, once again, is bringing the "Disk" back into diskmag! This time on the Amiga! !